You are here: Home 2013 August For the narcissist within! Dr. Weeks’ Comment: Technology is often co-opted for weaponry – here is a new spin of how to use technology! In ancient Greece, wealthy citizens commissioned busts of themselves in bronze. Centuries later, subjects sat for painted portraits, and then eventually for Daguerreotypes that could take upwards of 15 minutes to expose. At some point in the last 20 years, you probably hung around with your family in a Sears wearing a ridiculous turtleneck while an employee documented your clan in a few stilted photographs. So what’s next? Maybe something closer to those Greek sculptures-just a lot smaller. It might seem a bit gimmicky if the results weren’t so stunning. Using the latest in 360-degree scanning and 3-D printing technologies, Twinkind, a new company based in Hamburg, Germany, will turn you, your loved ones, or your pets into a marvelously detailed little statues. It might seem a bit gimmicky if the results weren’t so stunning. The final figurines, which can range in size from roughly 6”³ (around $300) to 13”³ (around $1,700), are strikingly, maybe even a little unsettlingly realistic, capturing everything from poses and facial expressions down to hair styles and the folds in clothes, all in full, faithful color. Twinkind was started by two creatives, Kristina Neurohr and Timo Schaedel, who found inspiration in a Tokyo pop-up shop called Omote that billed itself as the world’s 3-D photo booth. Neurohr and Schaedel were enamored with the little figurines the shop produced, and by the time it wrapped up its temporary stint this past January, the duo was already hard at work figuring out the technical side of their own operation. They wanted to produce as realistic figurines as possible, and they wanted to be able to scan customers near-instantaneously, by machine, as opposed to relying on the handheld approach employed by the Tokyo project. Thankfully, Schaedel’s background as a director of effects-heavy TV commercials meant he was well-suited for the challenge. After much experimentation, they perfected a system that could photograph subjects in the round in a split second-something similar to the 360-degree camera rig that gave the Matrix it’s signature bullet-time shots. “The products are small, but the technologies and workflows are pretty complex,” Schaedel says. You’re free to go wild. Wear a backpack or a funny hat. There are limitations. The company suggests avoiding some materials, like silk, tulle, and chiffon, for your big day-they all are liable to trip up the scanning software. Glasses must be taken off, too, though Twinkind will reintroduce them for you digitally afterward. Otherwise, you’re free to go wild. Wear a backpack or a funny hat. Bring your dog. Dress your kid up like a character from the Newsies (that seems to be a popular option.) Once scanned, Twinkind renders your digital likeness into a physical object with industrial-grade, powder-based 3-D printers, taking a final pass by hand to make sure all the details are as lifelike as possible. Judging by the photographs, the results aren’t perfectly consistent. Some of the models take on a strange, spectral glow-a sort of ghostly white outline around the face that can break the spell upon the closest scrutiny. Others, however, look pretty much perfect, like the subject just sauntered in front of the Honey I Shrunk the Kids ray. Neurohr and Schaedel opened their first outpost in Hamburg in June, hoping to get a feel for what kind of demand there would be for tiny, unblinking versions of ourselves. How’s it doing so far? “Tremendously well,” Schaedel says. The duo are eager to push the product into even more lifelike territory as the technologies involved continue to develop. They’re already looking at the possibility of expanding the operation to other countries. But for Schaedel, the success isn’t entirely surprising. More than a novelty of the nascent 3-D printing age, he sees the figurines as the logical progression of our age-old desire to document ourselves. 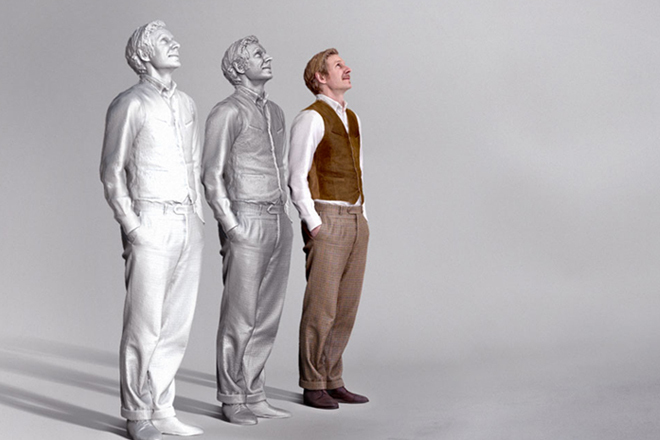 “We do believe that 3-D photo figurines will become a well-regarded addition to our photography culture,” he says. “I think many like the idea of freezing a moment of time.” Especially when you can fix your hair in the modeling software before it’s set in stone. We docs, talking amongst ourselves.